How Did Mongolia Start Producing Crops Of Gifted Young Opera Singers? Westerners don’t think of this huge, remote, sparsely populated country as an operatic hotbed, but singers from there have started taking big prizes at competitions like Moscow’s Tchaikovsky and Cardiff’s Singer of the World. 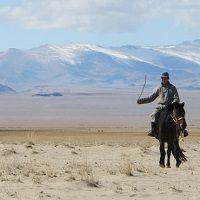 Kate Molleson went there, and traveled 1,000 miles from the capital, Ulaanbaatar, to a lake in the Gobi Desert, to find out why.